Dateline July 2, 2015 - Pictured above is SCAN Sales Representative Luis Robles (Center) with CIS Management and Staff. SCAN Health Plan sponsored the event. Over 120 Dual Eligible (Medi/Medi) SCAN members and guests attended the popular annual celebration. 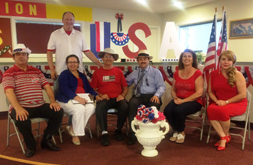 Participants enjoyed entertainment, dance and a traditional BBQ lunch. 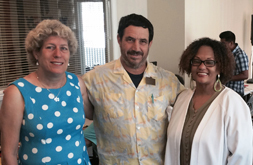 Dateline July 7, 2015 - Pictured above are North Hills West Neighborhood Council Members Nancy Xander (Left), David Hyman (Center) and CIS Computer Literacy Instructor Patrice Watterson (Right). The North Hills West Neighborhood Council recently donated 18 refurbished computers to upgrade the CIS Computer Learning Center. This enhanced tech access for neighborhood stakeholders.